Remember thinking “How am I going to learn all this? !” when you got your first 600-page text book? We had high school flashbacks while investigating all the details from Form I-9 and E-Verify as we rolled out Choice Screening I-9 ComplyTM! Not to worry! We’ve studied our books and will guide you through those massive rules and regulations (think really good Cliff Notes with a smile). Within those hundreds of pages, there’s a lot we can talk about. Today, we are going to focus on the employment eligibility verification as well as the differences between a background search you already use. Verifying employment eligibility is performed through completion of Form I-9. First, the employee completes Section 1 of Form I-9 (on the first day of employment). This is followed by you completing Section 2 when the employee provides documents from List A, or B and C (by day 3 of employment). You can either stop once you've completed both sections of Form I-9, or you can complete the form and run the employee through E-Verify. If you receive verification confirmation through the Social Security Administration (SSA) and Department of Homeland Security (DHS), you're using USCIS’s E-Verify (United States Citizenship and Immigration Service). Using E-Verify can either be voluntary or mandated - such as by industry or if you have a federal contract with a FAR Clause. This is your 100% guarantee that the employee is or is not eligible for employment. That being said, violations of any regulation or MOU responsibility, error in processing, and other inconsistencies or procedural issues still leave you vulnerable during an audit. Our online Form I-9 uses a direct interface wiht E-Verify to not only verify eligibility but reduce errors, easily enter, manage and update your verifications, quickly prepare for an audit and receive additional support and guidance. Employment Eligibility can also be verified the old fashioned way (for lack of a better term) by simply having the employee complete Form I-9 Section 1 and obtaining documents from List A, or B and C, viewing the documents for authenticity, and properly documenting the information on those documents on your portion of Form I-9. If you hired someone after 1986, when Form I-9 was initiated, you’ve probably done this once or twice. Your focus here should include: proper document maintenance, consistent practice, follow the rules, and make sure you don’t have an E-Verify requirement. Technicalities and errors on Form I-9 tend to be common causes for fines during an audit. Sophisticated software has been developed over the years to use error checking algorithms so products like I-9 Comply can identify potential errors, greatly reducing your risk. Have you audited your existing Form I-9's lately? Download our guide to Internal Form I-9 Audits. When you process your applicant’s SSN Trace in our system, it comes back as verified (in addition to other information that is received). Eligibility verified done, right? Nope. Even though we receive the verification information from the SSA, all this is doing is telling you if the 9-digit sequence is a real SSN, NOT that the employee is eligible for employment. Furthermore, the number is not also verified by DHS, an E-Verify requirement… Further still, if you don’t use or aren’t required to use E-Verify, you don’t need to “officially” verify the SSN with the feds. Just look at the SSN Card and decide, as a reasonable person, I believe this looks authentic. That’s the extent of verification you are required for Form I-9 alone. The vast majority of you likely receive a SSN card and Driver’s License from most of your new employees for Section 2 documents. (Honestly, it’s all he could find before coming into work that day!) We’ve already distinguished that the SSN Trace service is irrelevant to verifying that the employee is eligible for employment. But, what about the Driver’s License? 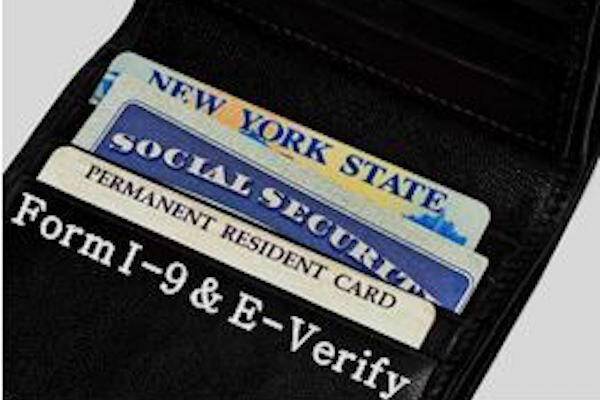 Similar to the SSN card, running an MVR does not satisfy verification of eligibility. However, inspecting the license and deciding yup, that looks authentic will suffice! The same goes for any document the employee gives you. Since we’re talking about the List documents, you should also consider this: you are prohibited by law to require the employee to produce any specific document – including the SSN card. The employee must be allowed to provide any document they choose from List A or one from each Lists B and C. Additionally, the employee has the option to write their SSN on Form I-9; you can’t require this either. The only exception to these rules is if you process your employees through E-Verify, you do need to require (1) the SSN provided in Section 1 on Form I-9 and (2) a photo ID if the employee chooses to give you a List B document (List A is a passport so that’s going to have a photo already). Always properly complete Form I-9 to verify employment eligibility. E-Verify is the only way to to receive employment eligibility verifications directly from the SSA and DHS. Avoid confusion with the SSN Trace, which is used to retrieve address history, employment history, validity of the SSN, etc., to support and supplement your pre-employment background checks. Call us if you have questions to learn more about electronically managing your Employment Eligibility Verification. Does your company hire employees? Let us help you make sure you're following all the Form I-9 rules! Here's some things you might not know about Form I-9 and E-Verify!